One of the greatest things about Milwaukee is that we love live music! And a great place to catch a concert is at the Rotary Amphitheatre at Discovery World. During the summer, music fans can check out “Live at the Lakefront” which features free weekly concerts. 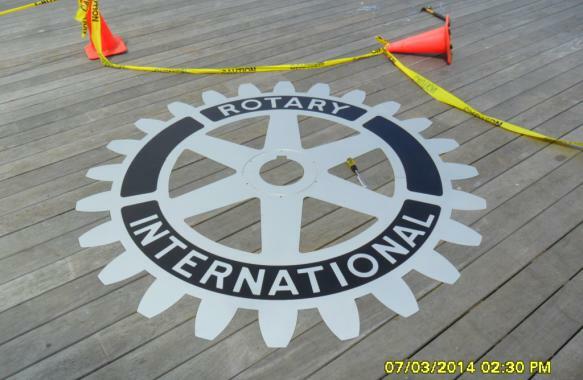 Concert goers will get a good look at the Rotary Club logo inlay we fabricated in our shop and installed at the amphitheater. 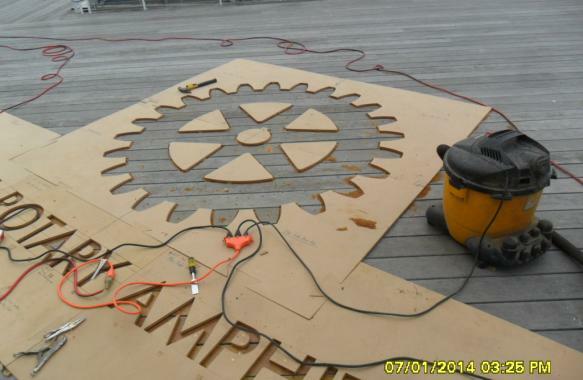 Located in a highly visible spot on the deck, the inlay is hard to miss. And it’s more than just your ordinary sign! Check out the video of our installation crew to see why. 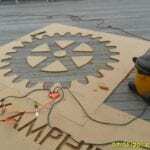 With our CNC router we could machine “disposable templates” out of ½” MDF material. We placed the template down on the deck and followed it to create each letter. All the letters have a stud on them that go through the deck rather than just an adhesive. That’ll make sure they stay in place regardless of the amount of foot traffic. 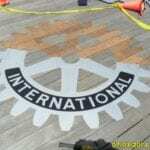 The gear logo consisted of multiple layers of anodized aluminum. The black colored features on the gear logo are 1/8” thick black anodized and are inlayed into the 3/16” thick clear anodized gear and were pre-assembled at the shop. 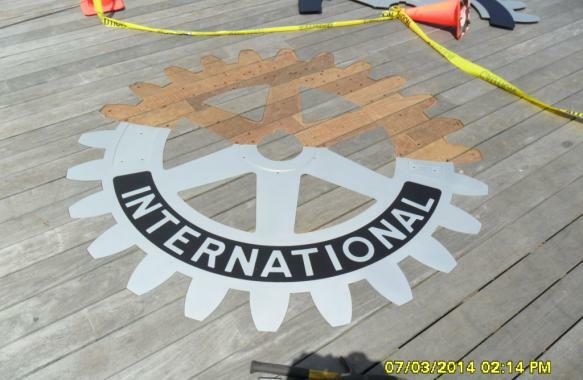 The entire gear logo was then inlaid into the wood. This approach means the colors will stand up to the elements for a longer period of time. 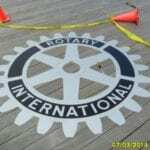 As you may know, The Rotary Club of Milwaukee is “part of a worldwide network of over 1.2 million men and women who make a difference in the lives of people in their communities and around the world”. Rotarians network with each other and work together to find solutions for issues of poverty, illiteracy, clean water, environmental improvement, hunger and disease. Thanks to Engberg Anderson for reaching out to us on this, it’s great collaborating with them. And thanks to our installation team of Jerry Rossetti and Steve Bruder, who completed the job with high precision and attention to detail! – Mary McCormick, Director Milwaukee Rotary Club.